As it turns out, we are not only without a stove for a while at my house, but we are also out of a kitchen floor. So I will be unable to cook anything for a while, which is annoying. It is probably a good thing, though, that I am not able to cook the Dickensian gruel that was served to adventurous eaters in London last week. Even the French chef who prepared it couldn’t do much to make “the barely-palatable meal composed of water, oats and milk, plus an onion” tasty, apparently. 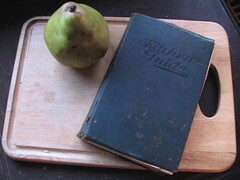 The Royal Society of Chemistry didn’t publish the recipe they used, but there are gruel recipes here. Truthfully, it sounds a lot like the oatmeal porridge I’ve made for Jason in a slow-cooker. With the right added ingredients it could probably be good. But plain Oliver Twist workhouse-style gruel was probably never all that appetizing, though those in workhouses were hungry enough to eat it anyway. Kristen and I gathered at the house tonight to make our Welsh Rabbit. Kristen brought Caesar salad to eat along with the “rabbit.” Jason was there to help eat the food. 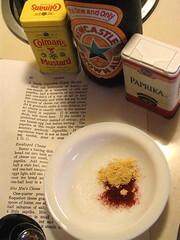 Melt one tablespoon of butter, add one-fourth of a teaspoon of salt and paprika, half a teaspoon of dry mustard and one-third of a cup of ale or beer. Stir constantly, and when hot, put in half a pound of cheese cut into small pieces. As it gradually melts it may thicken, for no cheese is exactly alike in the amount of liquid it requires. If it seems too thick, add more beer. If the rarebit is preferred creamy instead of stringy, add one beaten egg just before serving. The paprika in this recipe makes the cheese mixture perfectly digestible. If the regulation toast is not at hand for serving rarebit, pour it over saltines.–I. G. C.
This is not too difficult a group of ingredients to assemble. For the cheese, we picked up some Coastal Rugged Mature English Cheddar Cheese at Costco, and it’s really tasty stuff. Yum. For the ale, we got Newcastle Brown Ale. For the toast, we had some rolls from the local bakery — probably not exactly what was intended, but they were fresh and seemed as if they’d make fine toast. I got all the ingredients together, sliced the rolls and put them on a baking sheet, turned on the oven to toast the rolls, and was ready to start cooking. I melted the butter, and then added the spices and beer. So far, so good. I wanted to get the rolls toasting so they would be perfectly toasted right about the time the sauce was done. But first, I put the cheese in the pan. This was probably a miscalculation. As I stirred the cheese, Kristen opened the oven to put the rolls under the broiler, and… the oven was cold. Broken, that is. The knob had been turned on correctly, but nothing happened. I continued stirring the cheese, and the sauce looked about perfect… but we had nothing yet to pour it on. Jason came in and twiddled with the oven and got it to come on. Then it turned itself off. Then Jason got it to go back on again. The rolls were finally toasting… and right before our eyes, the cheese sauce started to separate. We cooked it too long, I think. We added the beaten egg as the recipe optionally calls for, but we still had an ugly-looking stringy mess. Smelled good, though. Shortly after we poured it on the toasted rolls, sort of. The thickest parts sort of glopped on. Kristen said it was “unappetizing.” We dished up our salads and settled down to eat. Wendi: Thought it was ugly, and obviously not what it was supposed to look like, but it actually tasted pretty good anyway. Kind of salty, though. Would be willing to try it again. Kristen: Hated it. Would not try it again. Thought it was too salty. Jason: Liked it and would definitely eat it again. Enjoyed the leftover brown ale with it, too. If I try this again, and I probably will, I will probably just toast the bread in a toaster, and heat the sauce under much lower heat, so it would not cook as quickly. Since it was a chafing-dish meal in the first place, I really should have done that all along. (What was I thinking? This was pure cook’s error. I would have gotten away with it if not for those meddling kids if I’d taken the sauce off the burner as soon as it looked right, though.) Also, I would probably not add all the salt in the beginning, and would salt to taste a bit later, which might help with the saltiness Kristen and I noticed. The aged cheddar seemed particularly salty in flavor to start with. This may be something that varies with different cheeses, I think. Other recipes I’ve seen include a little flour; I wonder if that would make the sauce a bit more manageable. Having anchovies in the Caesar salad with it did not help as far as saltiness is concerned! Something to balance out the salt would be nicer as a side dish. Maybe a sweeter salad dressing? I think one of the reasons that this dish has fallen by the wayside in recent years is the fussiness of making the cheese sauce. The average American household, sadly, is probably more likely to open a can, or just have a toasted cheese sandwich when it comes down to it. Welsh Rabbit, or Rarebit, isn’t quite as obsolete as some of the recipes we’re interested in trying. After all, you can still buy it from Stouffer’s. Alton Brown made it on Good Eats. And, while researching this post, I found that a recipe for it was printed on the New York Times website just a couple of weeks ago. It’s supposedly common British pub food. But here, in America’s Pacific Northwest, it’s rarely seen. I’ve certainly never seen it on a menu, whether in a restaurant or a pub. All I really knew about it was that it involved cheese somehow, and had a reputation for causing bad dreams after eating it. In the vintage cookbooks we’ve been exploring lately, Welsh Rabbit is ubiquitous (though usually called Rarebit), and several variations of the dish may be found. My grandma’s Kitchen Guide cookbook from the early 30s (maybe earlier — the book has no copyright date) has Welsh Rarebit, Spaghetti and Olive Rarebit, Mexican Rarebit, English Monkey (for the name alone, we are totally going to try this one), and Tomato Rarebit. 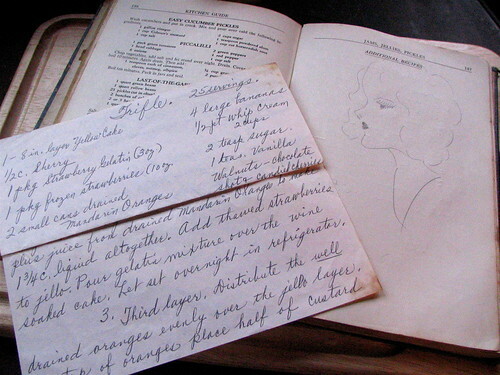 Fannie Farmer’s Boston Cooking School Cook-Book from 1896 adds Oyster Rarebit to the list. 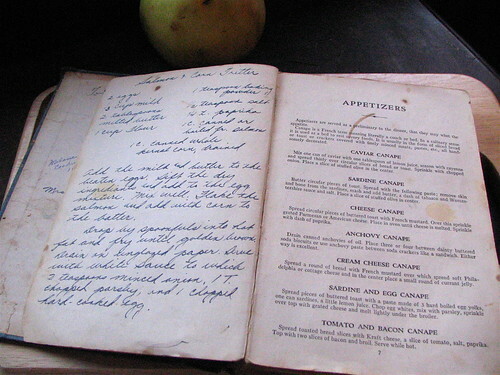 Mrs. Seely’s Cook Book from 1914 adds other recipes in the same genre: Golden Buck, Gherkin Buck, and Swiss Rarebit. These recipes, usually prepared in a chafing-dish, were commonly part of the “Sunday night” family meal, and were particularly valued during World War II, when meat was scarce. 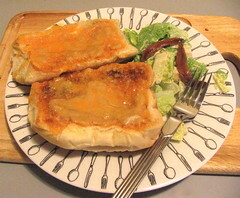 Though rarebit has not entirely disappeared from modern cookbooks, it is certainly less commonly eaten in the US than it once was. This is a shame, since anything that basically consists of cheese and beer and toast is pretty much going to be a hit with a fairly large segment of the US population. What’s not to like, right? But, instead, we’re going back exactly 100 years, to resurrect a 1909 version of this recipe, from the Good Housekeeping Woman’s Home Cook Book. (Thanks to Karen for sending me a PDF copy of this cookbook!) We’ll try it this evening, so stay tuned for a follow-up post with the results. 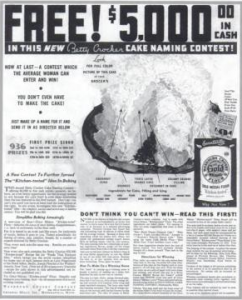 Recently I found a reference to Betty Crocker’s Gold-N-Sno cake, in the book Finding Betty Crocker: The Secret Life of America’s First Lady of Food. It sounded scrumptious. The book didn’t include a recipe, so I had to find one. 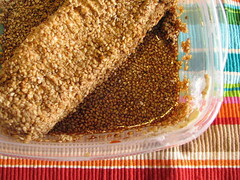 It did include a list of ingredients, which made it easier. 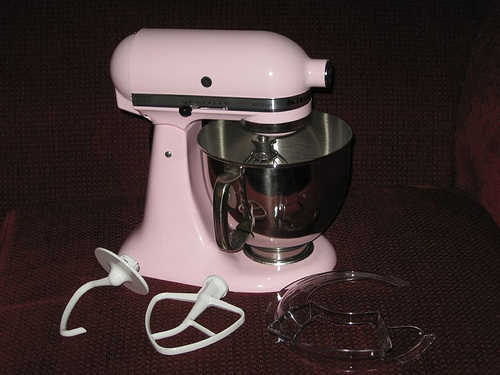 Since we hadn’t started Resurrected Recipes yet when I tried that recipe, the full story of the search and the recipe I ended up using can be found at my personal blog, Slumberland. Future projects will be posted here on Resurrected Recipes instead. The resulting cake was fabulous, though we were a little short on frosting, so the cake looked weird. I would gladly make this cake again. Hey Folks! This is actually my very first blogging experience and I can’t think of anything more fun than FOOD, glorious food! I’ve been cooking for as long as I can remember–from licking the beaters to cooking my very first Thanksgiving meal all by myself–and have long held a fascination for foods from the past that no longer appear in our day-to-day cooking habits. As a medieval history enthusiast, redacting recipes from the 13-1500’s is a very entertaining hobby as well. Occasionally, Wendi or I may wander into that territory to include it in our blog. Thanks for reading and check back often to see what we are up to. Currently, I am thinking a bit about the food we ate when I was a little kid in the 70’s. 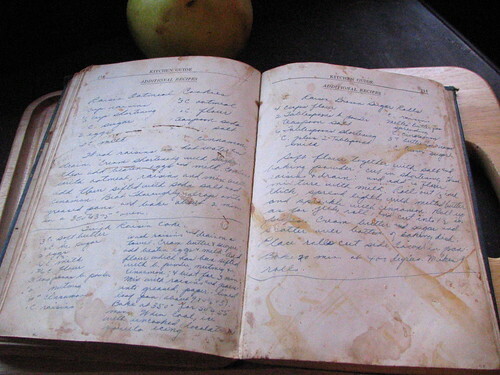 I am excited to be poring over my mom’s and grandmother’s old cookbooks in the search for old recipes that might be made new again.